On each desk are two copies of a text, one in Korean and the other in English. A handful of students ― some Korean, some international ― pore over each word, comparing and searching. A heated discussion ensues on the English translation of the Korean word “gap gap ha da,” as some favor “suffocating,” while others, “tedious.” A conclusion is difficult to reach, since the word could mean either of the two, or both, or even neither, depending on the context. Thus goes a typical class at the Literature Translation Institute of Korea’s translation academy. The process of translating a literary text is an arduous one, especially if the languages involved are as dissimilar as Korean and English. But two young Indian translators have dived into the endeavor. But in many more ways, he adds, translation is an art, requiring an acute sensitivity to not only the languages involved, but also the culture of the readers. While growing up in India, Joseph developed an interest in East Asian cultures through his uncle, a professor of Japanese studies, and decided to major in Korean studies at New Delhi’s Jawaharlal Nehru University. There, he first encountered Korean short fiction with Ha Seong-ran’s “A Woman Next Door,” and soon came to love writers like Park Min-kyu, Eun Hee-kyung and Yi Sang. Now fluent in Korean, Joseph has swept accolades for his work, winning the LTI Korea New Translators Award and the Korea Times Modern Korean Literature Translation Award. A good translation, he says, is one that reads naturally, while retaining as much of the “Korean essence” as possible. Reetika Dutta, who is wrapping up her one-year program at the academy, agrees. Also a graduate of JNU’s Center for Korean Studies, Dutta was drawn to the idea of delivering “the spirit of a language” through an exact yet nuanced translation. At the same time, a literal translation rarely suffices. Translating literature, therefore, presents a conundrum between being verbatim and delivering a feeling, they said. How, then, does one fully straddle the two languages, the two cultures? “That’s why we take classes on Korean culture, and try to immerse ourselves in everyday life here,” Dutta explained. Alongside translation programs in English, French, German, Spanish and Russian, the academy also provides courses on Korean literature and its history. Often, classes turn into an interactive hub of discussion, breeding a sense of community among students. “It’s been the most enriching experience in terms of education,” said Dutta. 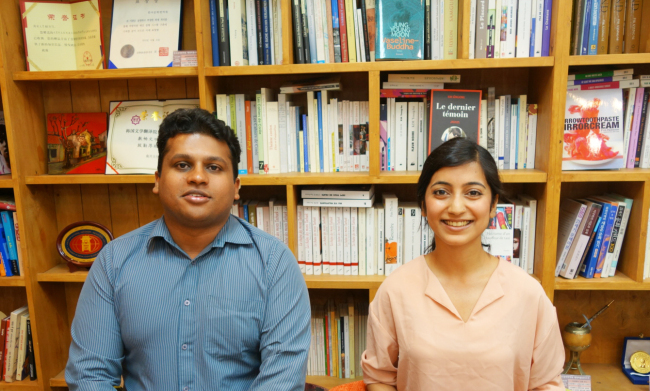 Being Indian has also helped the two young translators gain an advantage. “In India, we’re always moving between at least two languages in our daily lives,” said Joseph, explaining the country’s many regional languages in addition to English and Hindi. The most frustrating thing, they say, is when a translator knows what the text means, but cannot find the exact word that corresponds in the English language. A tortuous process then follows. “You work through all of your choices, one by one,” Joseph said. “But when you find that exact word” ― that rare English word that both captures the nuance of the Korean text and does not veer too far from its literal meaning ― “it’s elating,” said Dutta.